The finest hill-walking and scrambling routes on the mountains in Scotland's Islands. Hill walking routes in the Scottish Islands are listed below starting from south and working northwards. Nearer the bottom of the page is a table to help you find routes by distance, ascent, difficulty of terrain, quality of scenery and even by Munro and Corbett count. A circuit above Glenrosa in Arran and including Cir Mor and Goatfell. Some scrambling is involved while taking in superb views. 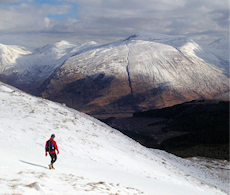 Ben More is a fine hill with some ridge walking and easy scramble - or just take the 'tourist route' up ! 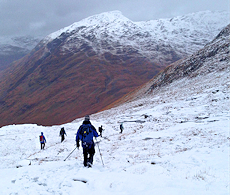 High above Craignuire, Dun da Ghaoithe is easily accessed using tracks. Excellent views. A small island boasts history, geology and green credentials. These two peaks, both craggy with huge drops, are well worth visiting. Excellent views combine with fine ridge and scree running to give a superb afternoon out. Tussocky ground leads to grassy ground higher up and rocky ridges with a wall to follow and superb views. Lots of scree and superb views. When the weather sulks on the Black Cuillin, the Red Cuillin often stays cloud-free ! Running along a spine of cliffs and hills, this group of routes ends at the spectacularly weird Quiraing. Locate routes by ascent, distance, quality of scenery, effort needed or even Munro and Corbett count using the table below. Sort multiple columns simultaneously by holding down shift key and clicking a second, third or even fourth column header! Routes without links are under construction and will be on website soon.